Cyp wrote: A well-designed codebase is easy to understand. Unfortunately, the codebase isn't well-designed, though. Some of the roughest edges have been sanded down a bit and/or rewritten from scratch — maybe someday the codebase will be well-designed? The main thing you don't despond! The work goes quietly but goes. At least in the program Gimp. [...] It's also easy to add a column for spectators. All this is easy to do. I just don't understand all the code right now. The minimum screen resolution of 640x480 pixels must be supported. Keep that in mind before creating GUI mockups. You increased the default screen resolution to 1024x768 in commit 9b0fa9e79a0e941c2f6d2e86795674872ef44217. Years earlier, you did indeed change the minimum screen resolution, but only for Qt, with the instruction `mainwindow.setMinimumResolution(QSize(800, 600));`, which is now found at './lib/qtgame/main_qt.cpp:75', as part of commit 5893d2998e315a3717708df808b72f31e0f4a0e. Yet this looks like an oversight, not a design decision. The minimum screen resolution is still 640x480. 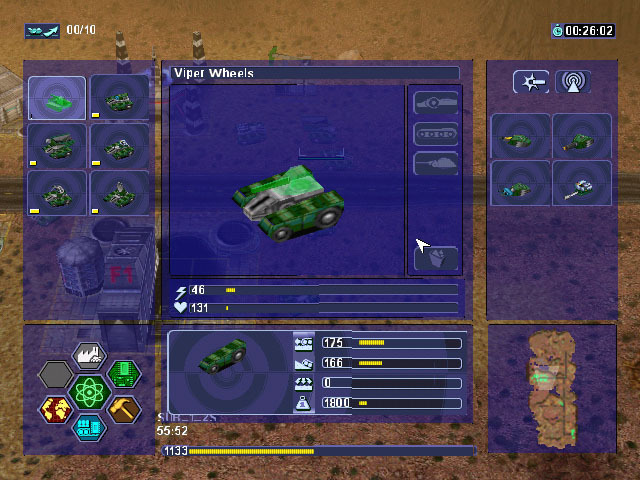 all GUI widgets were initially aligned to an orthogonal grid of that size. 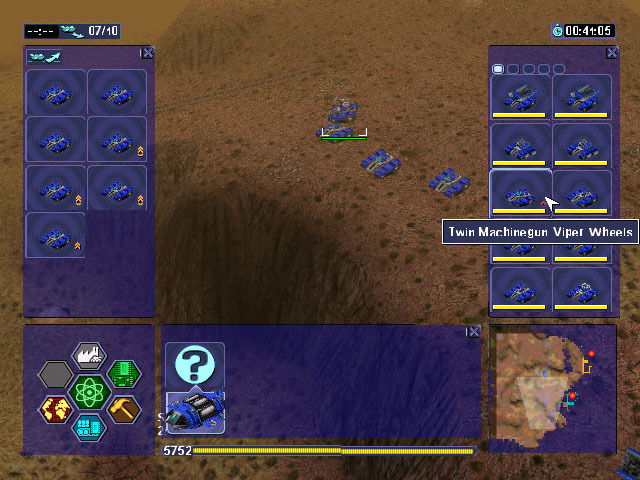 Screenshots from version 1.1, for instance, show menus to order reinforcements in campaign missions and design units filling most of it. The positions and sizes of such widgets are usually hardcoded constants, so that increasing the screen resolution merely widens the gaps between them. These values would be difficult to understand once the screen resolution they were based on for almost 20 years was no longer available. It would be harder to ensure that the GUI still works as intended. For example, overlapping or in other ways misaligned widgets are much easier to spot on the small screen. this constraint can help to ensure a simple, elegant user interface that is not cluttered with useless information. Designs which require more screen space are probably not well thought out. it is very useful to me in development. Precisely because of its small size, I can fit a Warzone 2100 window alongside a terminal into a single screen. Even comparing two game versions in neighbouring windows is possible in a 720p screen (this is not only great to test graphics, but also networking). The compact screenshots that result from the current minimum resolution are also easy to work with. I don't think we should bump it to 1024x768 because a lot of netbooks with 1024x600 screens were around just a few years ago. I still use 640x480 to reduce the utilization, since there is no headless mode. I will raise the issue of the need for release. There are currently no known critical bugs. Maybe it's time to make a candidate for release? Patches are so scarce that I expect no release within the year. contact other players who regularly play online. It is probably best to use a platform like VKontakte for this. I do not understand why it was possible to release 3.2.3 with a large number of known bugs, but you can not assign a new release on the last master? I have not met with problems in the Master which are not in 3.2.3. You offer me to actually fork the game. This will lead to an even greater separation of players by version. From my perspective, we are close to a new release, but there are a few key issues affecting builds that need to be addressed first. I'm working on several of them. We'll get it done. In the future, I'm hopeful there can be a pattern of more frequent releases so that improvements & fixes (like those Forgon listed) can make their way to the player-base much more rapidly. The default resolution should work for most users. According to statistics from GlobalStats, the current default resolution of 1024x768 pixels is used by roughly 3% of desktop users, whereas the resolution you suggest is not among the 10 most common ones (and has never been since data were collected from 2009 onward). Why should it be adopted then? NoQ was referring to the minimum screen resolution, not the default screen resolution. With a resolution of 640 can not do without horizontal scrolling.